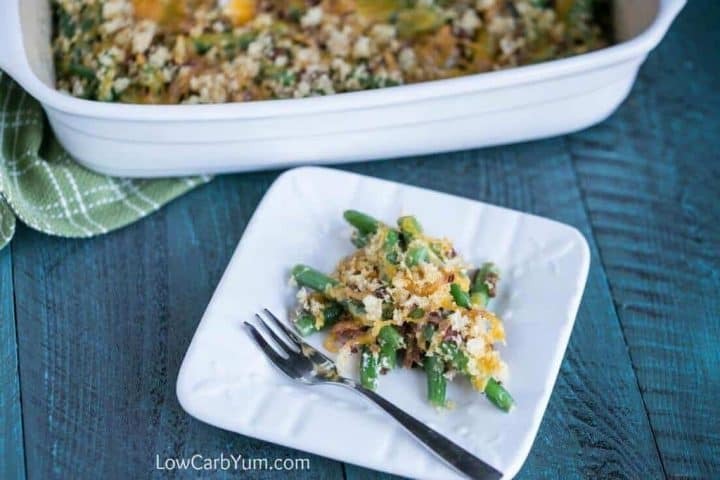 A low carb gluten free green bean casserole that doesn’t use canned soup as a base. Sour cream, cheese, and bacon are added to enhance the flavor. The weather has been cold for a few months. So, we’ve been spending most of the time indoors staying warm. Casseroles are one of the meals we enjoy most in winter. No matter what the flavor, casseroles are a perfect comfort food when it’s cold. Although best known as a standard holiday side dish, green bean casserole can be enjoyed any time of the year. However, most recipes call for cream of mushroom soup as the base. I don’t always like mushrooms with my green beans and the ingredients in a can of condensed cream of mushroom soup is a little scary. I try to stay away from processed foods as much as possible. 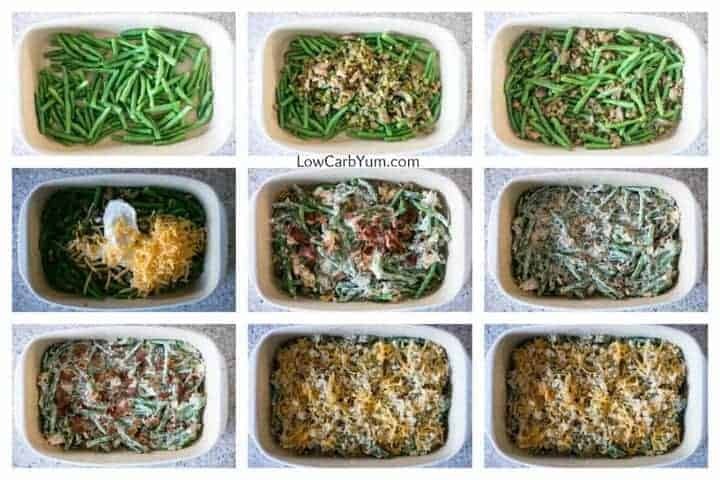 That’s why I make a low carb gluten free green bean casserole from scratch. It’s made with only wholesome real food ingredients. I start with a bag of fresh or frozen green beans and cook them crisp tender. Then, I fry up some bacon until crispy. 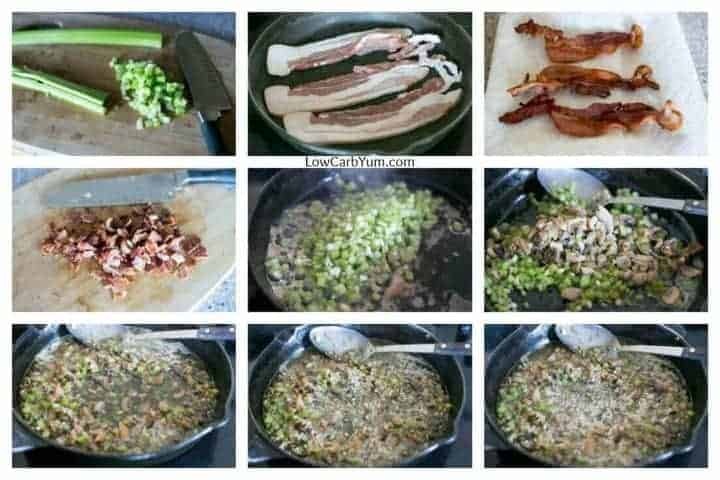 When I first created my low carb green bean casserole, I didn’t add the bacon. But, I thought it would be a good addition along with the sour cream and cheese. And, the bacon grease is perfect for cooking the celery and mushrooms in. 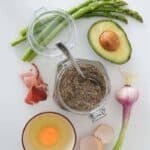 Now only does it add flavor, but it’s a great source of healthy fat. The celery needs to be cooked until very soft as you don’t want the celery crunch in the casserole. You can leave out the mushrooms if you wish, but they are typically added to a traditional green bean casserole. I make the casserole in a 7×11-inch casserole dish. To make a larger size for big holiday dinners, you’ll want to double the recipe and bake it in a standard 9×13-inch casserole pan. Although I prefer baking my casseroles in a stoneware pan, you can use a glass, or enameled cast iron baking pan instead. I don’t recommend using a metal baking pan as it can add a metallic taste. In my original recipe, I also didn’t add any crushed pork rinds on top. I thought the casserole needed a little something more on top besides the cheese and bacon. 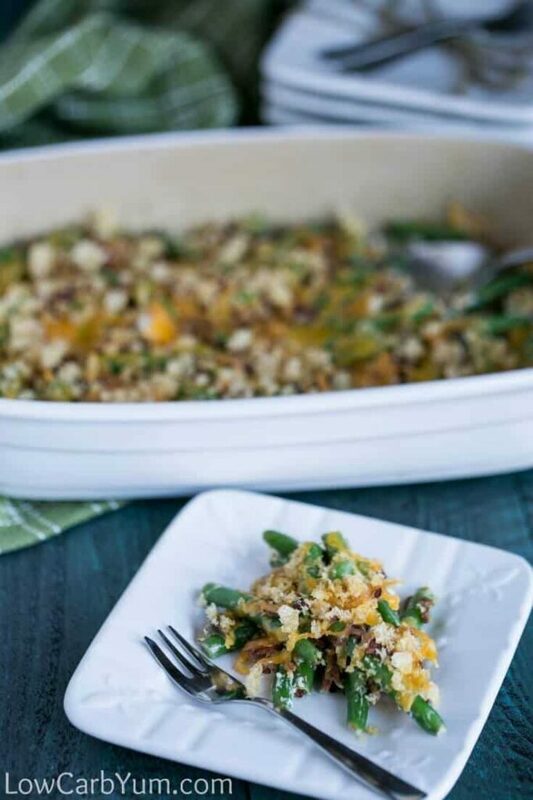 Feel free to customize this gluten free green bean casserole to suit your own taste. Just be sure to keep all the ingredients low carb. For those that like the crispy onions on top, I’ve got a solution. You could fry up your own onions until golden brown and chop up to sprinkle on the top of the casserole. 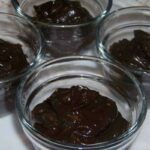 This is also a dish that can be made in advance to spread out the cooking for holidays. I often make this dish up one or two days ahead and bake it just before serving. Cooking in advance really helps when planning a large holiday meal. And, this is a dish that everyone loves to have along with turkey or ham. 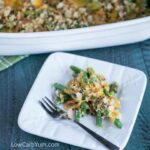 We love this low carb casserole better than the one made with processed ingredients. Why not give it a try and see for yourself? 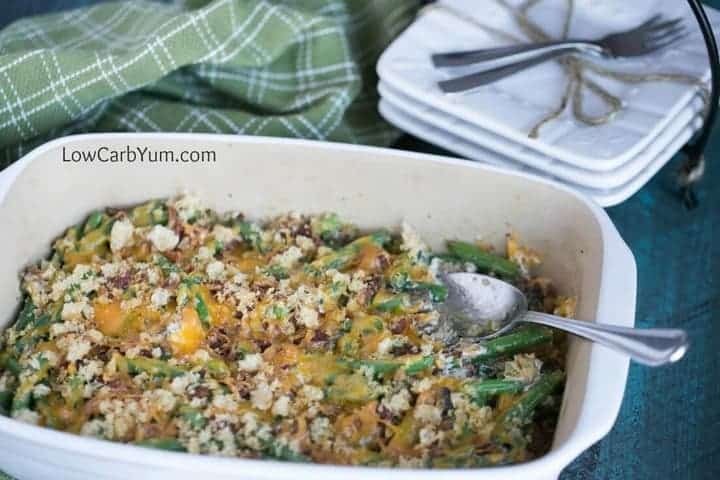 If you are looking for more of a casserole meal, you may want to try my chicken green bean casserole recipe. It combines the chicken and greens beans in a delicious cream cheese sauce. You can find that recipe here. 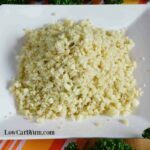 And, if you are looking for more dishes for a holiday meal, check out my low carb side dishes recipe round-up collection. 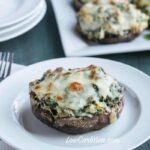 You are sure to find a new family favorite that’s low carb and gluten free! 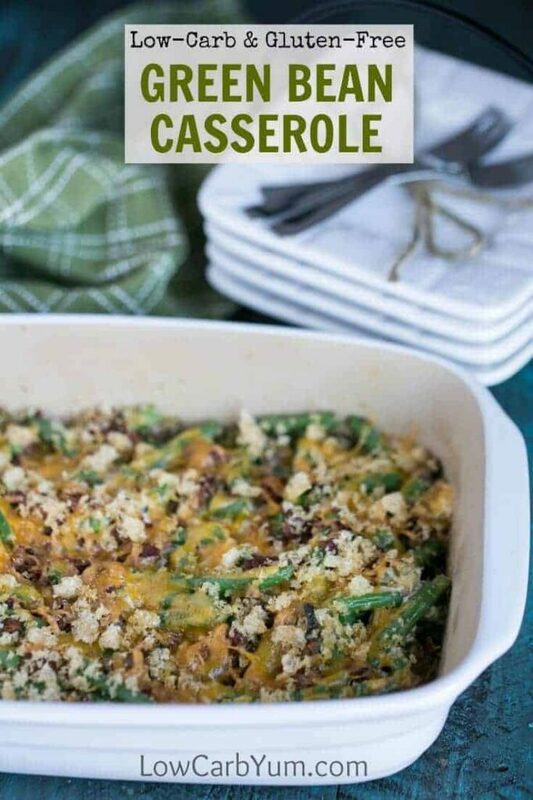 A low carb version of the traditional holiday casserole that doesn't use canned soup as a base. Sour cream, cheese, and bacon are added to enhance the flavor. Boil green beans according to package directions until just tender. Fry bacon in pan, then remove and drain on paper towels keeping grease in pan. Cook celery, garlic, and mushrooms (if using) in hot bacon grease with butter until celery is soft. Add chicken broth, dried onion and thyme and continue cooking for about 4 more minutes. Combine green beans and celery mixture into 1 1/2 quart baking dish. Reserve about 1/4 cup cheese. Stir in remaining cheese along with sour cream. Then, stir in half of the bacon. Sprinkle the reserved cheese and bacon on top. Top off with crushed pork rinds (if using). Dish can be made one or two days ahead and baked just before serving.